Phil commenced woodchopping in 1964 at age 28. He cut second in nine different championships before winning the 14 inch Underhand Title at the Townsville Show in 1966. He followed this with wins in the 13 inch Standing Block Championship at Lawnton Show and then the 12 inch Standing Block Championship at the Brisbane Exhibition that year. 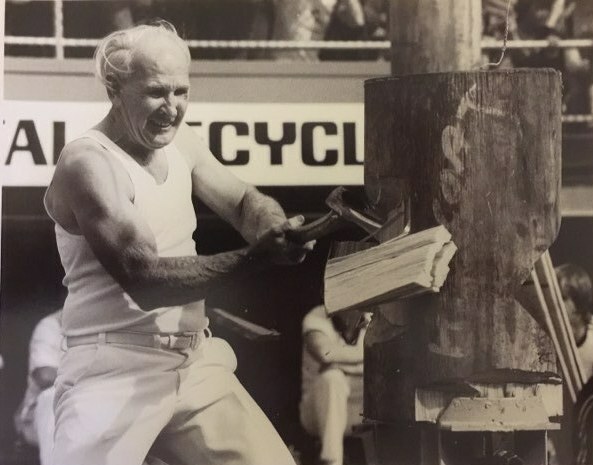 He won the 15 inch Standing Block Championship at Brisbane Exhibition in 1973. He followed this with wins in the same event at Adelaide Show in September and Perth Show in October of ’73. In 1978 he won the inaugural trophy for the Queensland Champion of the Year. In these earlier years you had to be an all-round axeman who could cut trees, underhand and standing blocks. Phil was a member of a private Veterans Team of six who went to New Zealand in 1977. they competed against a New Zealand team and this led to the formation of an official Australian and New Zealand Veterans Team who now compete against each other annually. While in New Zealand, Phil competed at the Masters Games and won a gold medal in the Standing Block at Wanganui. Over the years, Phil has won many District, State and several Australian Championships. He won the highest handicapped treefeller in Queensland at 132 seconds behind he did not manage to win a treefelling championship at the Royal Show. he cut second in Brisbane twice and also at Adelaide as well as places in Sydney Show but could not get a win. Phil was a member of he committee of the QAA for 25 years. When the Australian Axemen’s Council was formed he was an original members and attended meetings in Sydney and Adelaide for many years. 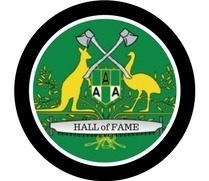 He is a life member of the QAA and in 1995 was the second person to be awarded a life membership of the Australian Axemen’s Association.